This project is to complete renovations to the Tiger Room which is in the basement of the Halifax Shambhala Centre. 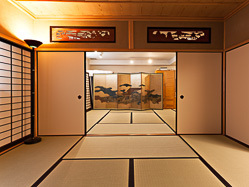 The Tiger Room houses the Yukoan Tea Room, which is an authentic Japanese Tea Room gifted to The Sakyong and Shambhala International by tea senseis John McGee and Alexandre Avdoulov. It houses the potential for 2 more tea rooms and preparation area which would allow for additional and larger tea events for both the public and Shambhala community. The tearoom was presented (disassembled, in crates) to Sakyong Mipham Rinpoche in 2003 and the building of it was completed in 2005. When the Sakyong accepted the gift, he requested that it be erected at the Halifax Shambhala Centre, allowing it to be widely available. The purpose of Yukoan tea room is to bring the culture and education of Japanese Tea Ceremony and Japanese culture to the Shambhala community as well as the greater Halifax and Nova Scotia community. Over the past 12 years, events have been held in Yukoan as have regular classes — both from regular committed tea students as well as students from Saint Mary’s University who are studying Japanese and Japanese culture with the senseis (they both are professors at the university). As well, students from other public and independent schools visit Yukoan to gain an understanding of this contemplative meditative art form.